Jared Kushner tells Congress: "I did not collude"
Giving his version of his Russia contacts for the first time, Jared Kushner says in an 11-page statement to congressional committees that he had "hardly any" contacts with Russians during the campaign, and regarded the meeting with a Russian lawyer at Trump Tower as "a waste of our time." Key quote: "I did not collude, nor know of anyone else in the campaign who colluded, with any foreign government. I had no improper contacts. I have not relied on Russian funds to finance my business activities in the private sector. I have tried to be fully transparent with regard to the filing of my SF-86 [security clearance] form, above and beyond what is required." 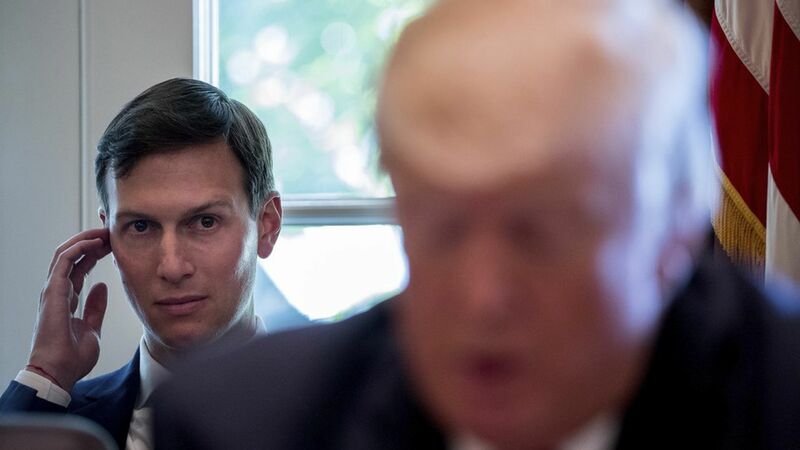 Why it matters: The stakes for the congressional interviews are high for Kushner because the Trump son-in-law is of acute interest to special counsel Bob Mueller, and prosecutors can be expected to pick apart today's statement. Kushner has a 10 a.m.appointment with staff of the Senate Intelligence Committee, and his meeting tomorrow with the House Intelligence Committee. Both sessions are behind closed doors. The most colorful passage: "[I]n looking for a polite way to leave and get back to my work," he says in the statement, "I actually emailed an assistant from the meeting after I had been there for ten or so minutes and wrote 'Can u pls call me on my cell? Need excuse to get out of meeting.' I had not met the attorney before the meeting nor spoken with her since. I thought nothing more of this short meeting until it came to my attention recently." Another highlight: "With respect to my contacts with Russia or Russian representatives during the campaign, there were hardly any. ... [T]he day after the election, I could not even remember the name of the Russian Ambassador. ... I sent an email asking [Dmitri Simes of the Center for the National Interest, which hosted a Trump foreign policy speech], 'What is the name of the Russian ambassador?'" "When it became apparent that my father-in-law was going to be the Republican nominee for President, as normally happens, a number of officials from foreign countries attempted to reach out to the campaign. My father-in-law asked me to be a point of contact with these foreign countries. ... [O]ver the course of the campaign, I had incoming contacts with people from approximately 15 countries." "I called on a variety of people with deep experience, such as Dr. Henry Kissinger, for advice on policy for the candidate, which countries/representatives with which the campaign should engage, and what messaging would resonate." "The first [campaign contact] that I can recall was at the Mayflower Hotel in Washington, D.C. in April 2016. ... [T]he host of the event, Dimitri Simes, ... introduced me to several guests, among them four ambassadors, including Russian Ambassador Sergey Kislyak. With all the ambassadors, including Mr. Kislyak, we shook hands, exchanged brief pleasantries." "Reuters news service has reported that I had two calls with Ambassador Kislyak at some time between April and November of 2016. While I participated in thousands of calls during this period, I do not recall any such calls with the Russian Ambassador. We have reviewed the phone records available to us and have not been able to identify any calls to any number we know to be associated with Ambassador Kislyak and I am highly skeptical these calls took place." "I had no ongoing relationship with the Ambassador before the election, and had limited knowledge about him." "The only other Russian contact during the campaign is one I did not recall at all until I was reviewing documents and emails in response to congressional requests for information." That was the Trump Tower meeting, and he said the invitation from Donald Trump Jr. "was on top of a long [email] back and forth that I did not read at the time. ... Documents confirm my memory that this was calendared as 'Meeting: Don Jr.| Jared Kushner.' No one else was mentioned." "There was one more possible contact that I will note. On October 30, 2016, I received a random email from the screenname 'Guccifer400.' This email, which I interpreted as a hoax, was an extortion attempt and threatened to reveal candidate Trump's tax returns and demanded that we send him 52 bitcoins in exchange for not publishing that information. I brought the email to the attention of a U.S. Secret Service agent on the plane we were all travelling on and asked what he thought. He advised me to ignore it and not to reply -- which is what I did. The sender never contacted me again." "On November 16, 2016, my assistant received a request for a meeting from the Russian Ambassador. ... The [Dec. 1] meeting occurred in Trump Tower, where we had our transition office, and lasted twenty [to] thirty minutes. Lt. General Michael Flynn (Ret. ), who became the President's National Security Advisor, also attended. "I believed developing a thoughtful approach on Syria was a very high priority given the ongoing humanitarian crisis, and I asked if they had an existing communications channel at his embassy we could use where they would be comfortable transmitting the information they wanted to relay to General Flynn. The Ambassador said that would not be possible and so we all agreed that we would receive this information after the Inauguration. Nothing else occurred. I did not suggest a 'secret back channel.'" "My assistant reported that the Ambassador had requested that I meet with a person named Sergey Gorkov who he said was a banker and someone with a direct line to the Russian President who could give insight into how Putin was viewing the new administration and best ways to work together. I agreed to meet Mr. Gorkov because the Ambassador has been so insistent, said he had a direct relationship with the President, and because Mr. Gorkov was only in New York for a couple days." "The [Dec. 13] meeting with Mr. Gorkov lasted twenty to twenty-five minutes. ... At no time was there any discussion about my companies, business transactions, real estate projects, loans, banking arrangements or any private business of any kind." "There has been a good deal of misinformation reported about my SF-86 [security clearance] form. As my attorneys and I have previously explained, my SF-86 application was prematurely submitted due to a miscommunication and initially did not list any contacts (not just with Russians) with foreign government officials." "[P]eople at my New York office were helping me find the information, organize it, review it and put it into the electronic form. They sent an email to my assistant in Washington, communicating that the changes to one particular section were complete; my assistant interpreted that message as meaning that the entire form was completed. "At that point, the form was a rough draft and still had many omissions including not listing any foreign government contacts and even omitted the address of my father-in-law (which was obviously well known). Because of this miscommunication, my assistant submitted the draft on January 18, 2017." "The very next day, January 19, 2017, we submitted supplemental information to the transition, which confirmed receipt and said they would immediately transmit it to the FBI."